In what concerns to coffee, we all have our own preferences. While you may like a black and strong coffee, another person may prefer a latte, a cappuccino or even a decaf. It’s just the way it is and we can say that no one is right or wrong here. It is just a simple matter of preference. 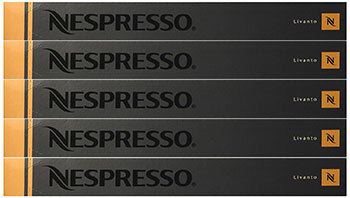 One of the questions that many people tend to ask around is concerned with the best Nespresso flavors. The truth is that we can’t just say that one capsule flavor is better than another one because we all have our own preferences. Nevertheless, we took a closer look at all of the different Nespresso capsules and we were able to select the 5 best Nespresso flavors. These best Nespresso flavors were gathered by looking at what most people were saying. So it is important that you notice that your favorite Nespresso capsule flavor may not be included in this list and that there are many other Nespresso capsules flavors that you may like as well. 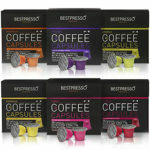 When you are looking for the best Nespresso flavors, you just can’t pass around the Nespresso OriginalLine: Ristretto. The reality is that the Nespresso OriginalLine: Ristretto tends to be a consensual choice in what concerns to Nespresso capsules. The Nespresso OriginalLine: Ristretto is a beautiful and delicious blend of East African Arabica and South America Arabica, with an extra touch of Robusta. 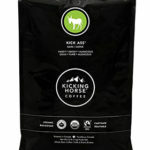 And this makes all the difference since it is roasted separately to provide the coffee beans with a unique fruity note. With an intensity of 10, the Nespresso OriginalLine: Ristretto is perfect to obtain a delicious espresso that is intense and features a full body and rich flavor. One of the best things about the Nespresso OriginalLine: Ristretto is the fact that you will also notice some strong roasted notes that are softened by some chocolate notes. This creates the perfect balance between bitterness and strength with fruity and acidic notes. Discover the best products rated by users. In case you just bought yourself a new Nespresso OriginalLine coffee machine or if you want to try out other Nespresso capsules flavors, one of the best options that you should consider is the Nespresso OriginalLine: Roma. With an intensity of 8, the Nespresso OriginalLine: Roma is a blend of Arabica coffee beans from Central America and Robusta and Arabica coffee beans from Brazil. The Nespresso OriginalLine: Roma is perfect for people who love espressos that aren’t very strong. After all, the Nespresso OriginalLine: Roma is able to deliver one of the best espressos. One of the details that are important to mention are the woody notes that you will notice and that provide you with a lasting taste. Besides, since the beans are only light roasted, even the inclusion of the Robusta doesn’t add that strong and bitter flavor to your espresso. One of the best things about Nespresso capsules is that there is always one that seems to suit your tastes perfectly. Nevertheless, it is kind of difficult to choose that one since there are so many different flavors that you’ll probably also love. One of the best Nespresso flavors that you can try is the Nespresso OriginalLine Capsules: Livanto. Even though the Nespresso OriginalLine Capsules: Livanto tends to be overlooked many times, it is one of their best according to our opinion. The Nespresso OriginalLine Capsules: Livanto is a pure Arabica coffee that comes from South America and Central America. Both regions are well-known for their amazing coffee beans. With an intensity of only 6, the Nespresso OriginalLine Capsules: Livanto is perfect for the casual coffee drinker as well as for the pickiest coffee drinkers. After all, the Nespresso OriginalLine Capsules: Livanto is able to deliver an amazing cup of coffee that is extremely complex. One of the main reasons for this to occur is related to the way the beans are cultivated. The truth is that these beans are cultivated according to the traditional methods in order to protect their fruity and malted accents and profiles. So, you can be sure that the Nespresso OriginalLine Capsules: Livanto is a kind of coffee that you probably never tasted before and that you can rest assured that you’re going to love. If you love to drink lungos, you’re going to love the Nespresso OriginalLine: Fortissio Lungo. 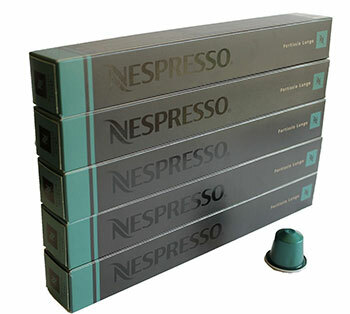 With an intensity of 8, the Nespresso OriginalLine: Fortissio Lungo is a strong and full-bodied blend that also includes some bitterness. 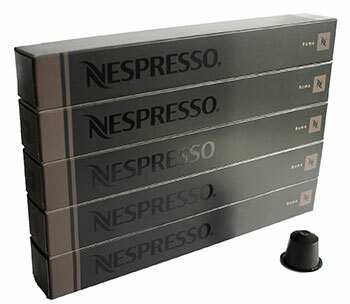 The Nespresso OriginalLine: Fortissio Lungo is a blend of Arabica coffee beans from Central America and South America and Robusta as well to add the bitterness touch. In addition, the roasting process is actually intense to ensure that you are able to get the maximum flavor of all the coffee beans included in this blend. In addition, it also reinforces the body as well as the intensity. Even though the Nespresso OriginalLine: Fortissio Lungo may not be appreciated by everyone, the reality is that there are many people who love it. After all, the Nespresso OriginalLine: Fortissio Lungo delivers a full body that includes a beautiful aroma of the beans that were intensely roasted as well as some woody notes that are a characteristic of the Robusta coffee beans. You will also notice some slight notes of sweet cereal that add the final touches to the balance of the Nespresso OriginalLine: Fortissio Lungo. 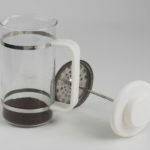 Discover the best thermal carafe coffee makers in 2018. Last but not least, one of the best Nespresso flavors that you can choose is the Nespresso OriginalLine: Decaffeinato Intenso. The Nespresso OriginalLine: Decaffeinato Intenso is perfect when you prefer to drink a decaffeinated espresso rather than a normal espresso. The Nespresso OriginalLine: Decaffeinato Intenso is a blend of Arabica coffee beans from South America and some Robusta and it has an intensity of 7. Discover the differences between Arabica and Robusta. 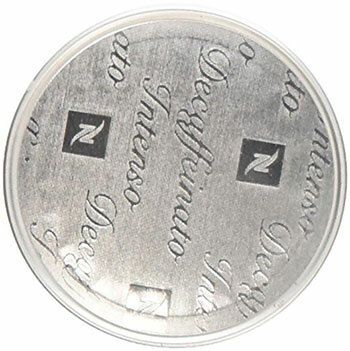 One of the things that make the Nespresso OriginalLine: Decaffeinato Intenso completely different from all the other Nespresso capsules flavors we mentioned so far is the cocoa notes. The reality is that this aroma is incredible especially when you are also enjoying the full-bodied decaffeinated espresso. Since the beans were intensely roasted for a very short period, you can be sure that you will get an intense and rich flavor every single time. You will be able to notice all these flavors and aromas not only on the coffee itself but on the amazing crema as well.